PT. 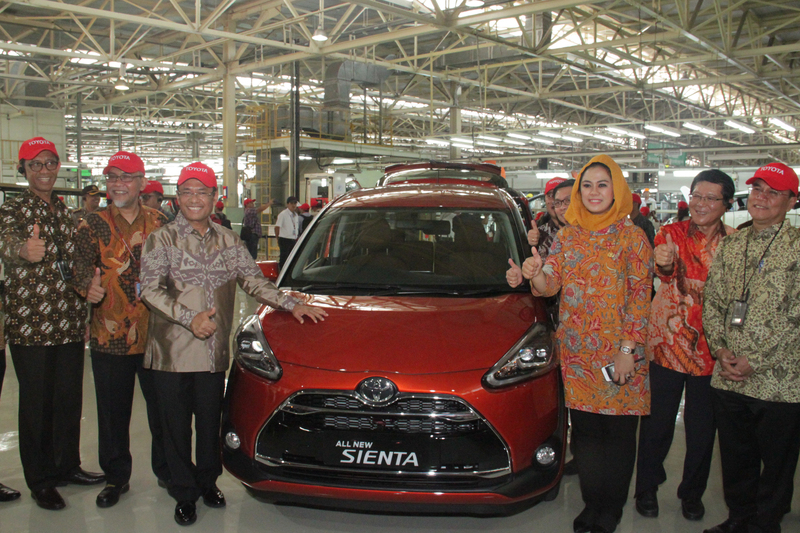 Toyota Motor Manufacturing Indonesia (TMMIN) was successfully held the official announcement of All New Sienta on Monday, 25 Juky 2016 at TMMIN Plant #2 Karawang. The event was attend by by Minister of Industry of the Republic of Indonesia Saleh Husin, Karawang Regent Cellica Nurrachadiana, PT. Toyota-Astra Motor (TAM) Vice President Director Henry Tanoto, and TMMIN President Director Masahiro Nonami. All new Sienta is manufactured in TMMIN Karawang Plant 2 which also housed Etios Valco, Vios, Limo, and Yaris production. The production plant is equipped with up to date technologies such as Servo Line in Stamping and Piano Welding which enhance precision, safety, and efficiency that help ensure the global quality of TMMIN’s made vehicle. All New Sienta is a symbol of Toyota Supply chain Indonesia’s power proven by its local ratio; 80% in the first production. Indonesia is first country outside Japan to produce Sienta. “We are very proud to have the trust as one of Toyota global production and export base for vehicle and engine in Asia Pacific. However, we need to work even harder to guard this trust, to continuously increase our quality and competitiveness so that Toyota operations in Indonesia could cater our customers better and grow together with Indonesia automotive industry,” added Nonami.